2013 looks like it’s going to be a good year for music, with The Bee’s Upfront series promising some really interesting international act. 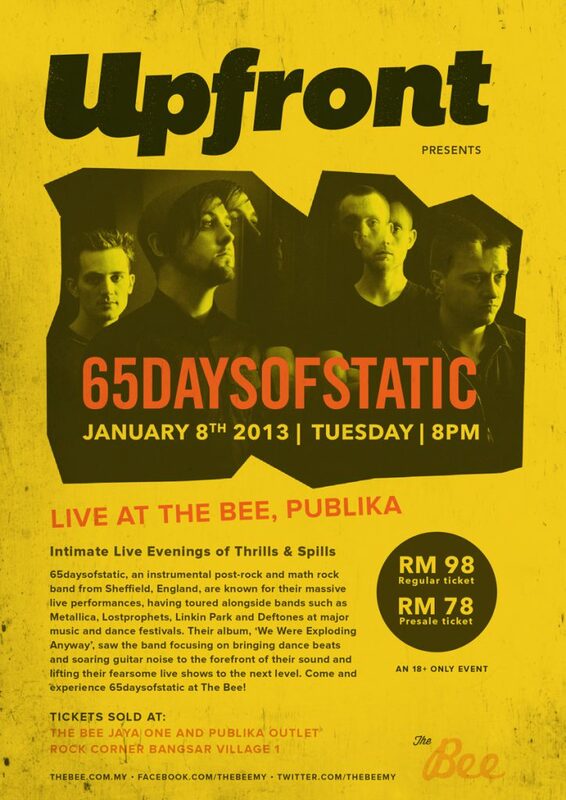 The series will kick off with 65 Daysofstatic, an instrumental post rock act from England. The boys from Sheffield have toured alongside big names such as Metallica and Deftones, and will be bringing their ammo down to Kuala Lumpur this coming 8th of January 2012. Opening for the show are our local post-rock heroes, Deepset, so expect an explosive show. The show is an 18+ only event, and presale tickets are still available for RM78 at The Bee Jaya one and Publika, and Rock Corner (at Bangsar Village 1). Alternatively, you can grab tickets at the door for RM98.